A while ago there was a very annoying error, that popped up each time we start Skype. It was back before the Skype Extras Manager was removed. Basically when you start Skype and sign in two messages popped up immediately. 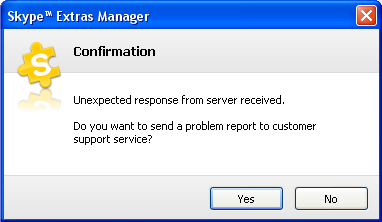 The first stated Unexpected response from server received, and the second Checking for available licenses. After some experimenting I found that the error is not related to the operating system (at least it was present in Windows XP and Windows 7), but it was related to the Skype version – Skype 3 and Skype 4 had the problem, but Skype 5 (starting from 5.0) worked just fine. Also the problem disappeared if we turn off the Skype Extras Manager. The first solution is to uninstall your old version of Skype and then install at least Skype 5.0. This will remove the problem even with Extras Manager turned on. 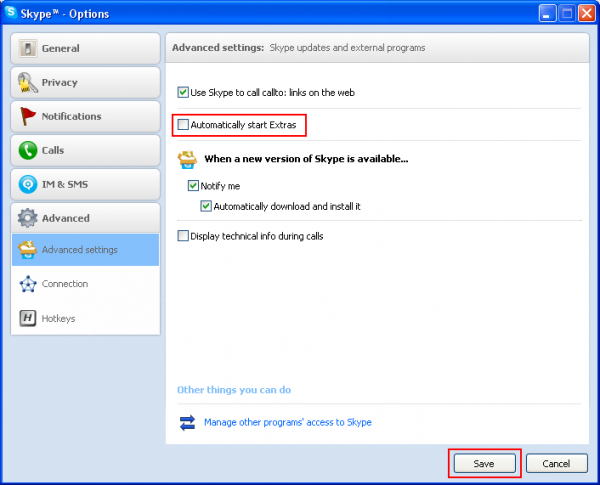 If you do not want to use Skype 5 and you do not need Skype Extras Manager (most people do not use it, this is why it was removed in later versions), then you can just turn it off. To do that open Skype and sign in with your Skype name and password and go the menus Tools -> Options… -> Advanced and then uncheck the checkbox Automatically start Extras Manager. Now quit Skype and open it again and everything should be OK. If somehow this does not work for you, you can uninstall Skype and install it again, but this time in the install options uncheck the checkbox Skype Extras so it is not even installed at all.